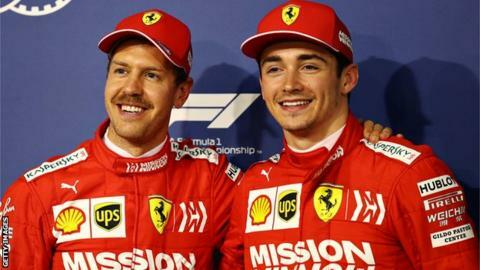 Polesitter Leclerc fell behind Vettel at the start of the race before dropping to third when Mercedes’ Valtteri Bottas overtook him too. However just a couple of laps later a small mistake at Turn 1 by Bottas allowed both Leclerc and Lewis Hamilton to get ahead of the Finn. Leclerc then set about chasing down Vettel a couple of seconds ahead and caught the German quickly. ‘I’m quicker guys’ came over the team radio as the 20-year-old made sure Ferrari knew he had more pace and just a lap later he slipstreamed Vettel down the start/finish straight to retake the lead of the Bahrain GP. However an unbroadcast radio message from Ferrari to Leclerc, which came after his own message saying he was quicker, told him to hold position for the next two laps. “Stay there for two laps, stay there for two laps”, was the order, which was sent at Turn 10 of Lap 5, but Leclerc overtook Vettel at Turn 1 on Lap 6, just five corners after the message. Leclerc confirmed after the race that he went for the overtake despite the order because the opportunity presented itself. I was just letting them know I was quicker. Then I think I had an answer, saying to me ‘OK, stay like this for two laps’ but then on the next straight I had the opportunity to go for it, so I went for it and it was a successful pass and then I was just quicker, so then I did my race. It’s always a tricky situation when you get to fight your team-mate because the risks are very high and, as in every team, I think, they warn you before the race: OK, you can try things on different people, but with your team-mate, please be careful which is something normal. So it’s always obviously that something more. But yeah, I had the opportunity on lap five and I didn’t hesitate, I just went for it. I was happy it was successful the first time I tried, especially after the bad start. So yeah, happy with how it ended-up.